Cinderblocks for a bench may not seem like the most intuitive choice of material (I mean, let’s face it, they are rather industrial looking), but it makes a lot of sense outdoors. Cinderblock is easy to maintain, has a nice aesthetic appeal about it, and there are cubbies for personal items and plants! Decorate it with a little paint and you can brighten it up a bit and give it a fun, quirky look. 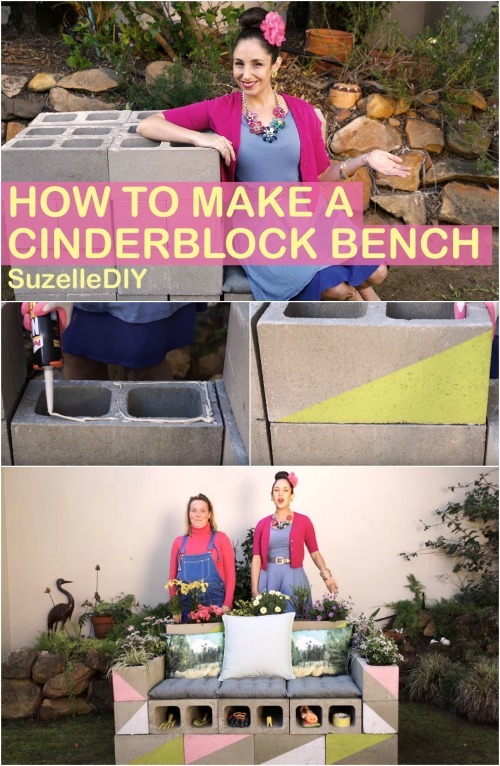 I really like the simple idea that they used here, but one great thing about this project is the fact that you could paint your cinderblocks however you wished to achieve a customized effect. The completed bench would be great for guests at parties, and would also be a great option for relaxing anytime on your own. This video also gets extra kudos for being quite funny and enjoyable to watch. I definitely recommend that if you haven’t yet, you check out other videos by SuzelleDIY. I am sure that they will give you more than a few laughs and great ideas for your own DIY and home organization projects!